The calendar says it’s spring. Outside, not quite, but I remain optimistic. Actually, it’s a little better than that. Howard planted peas in the vegetable garden last night, and this morning, I noticed the tarragon and chives have started to emerged from the ground. Waiting for warmer weather means that I no longer crave the hearty comfort food of winter. There still aren’t any local vegetables available, but lighter meals are what appeal. This week’s recipe for French Fridays with Dorie gets a big check mark on that count. The challenge this week is Salmon Tartare, a savory parfait, where the presentation is almost as satisfying as the taste. 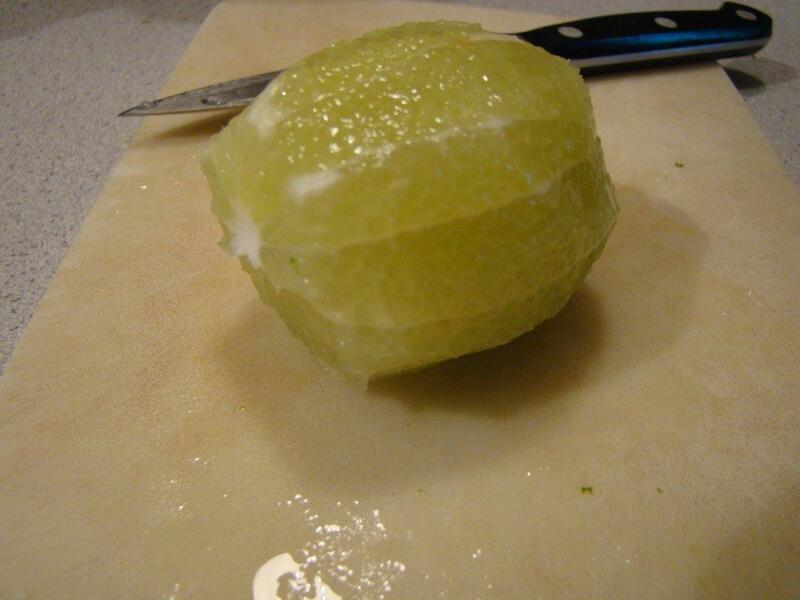 Naked Lime, ready to be supremed! 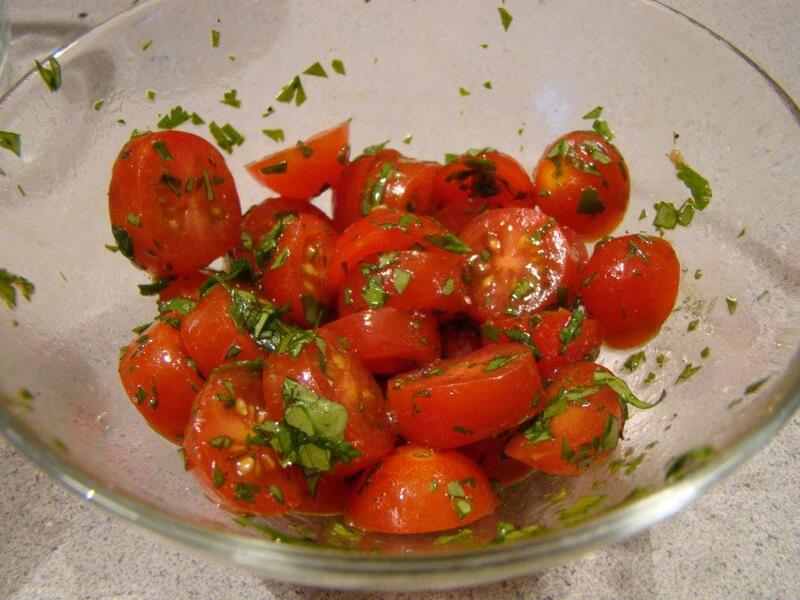 The herbs called for were mint and chives, but because of the tomatoes and avocado, this dish screamed “Cilantro!” to me, so that’s what I used. To serve, the layers can be formed in a ring that gets removed or a ramekin that gets flipped over. I chose to serve this in extra-large martini glasses. When I bought them, I didn’t realize that these festive glasses are larger than any cocktail that I can drink responsibly, so I was glad to have an opportunity to pull them out of the cabinet. 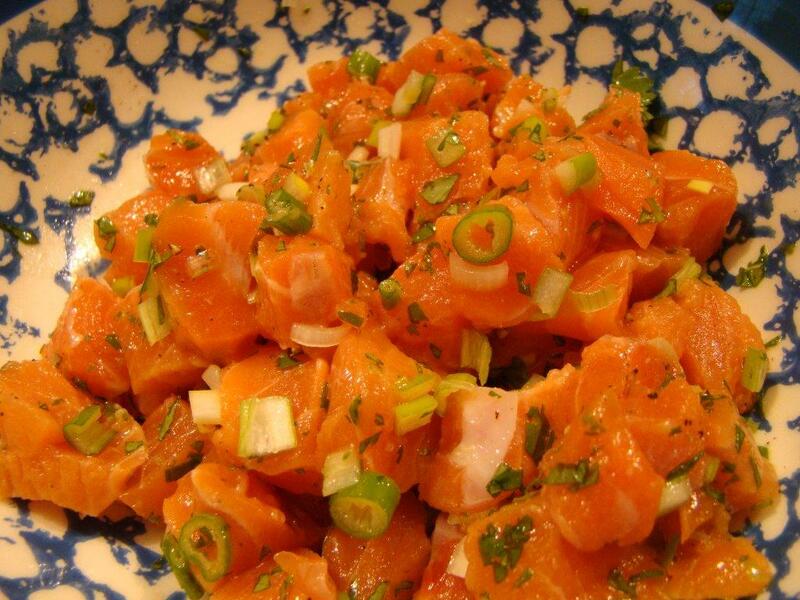 I served the salmon tartare for dinner. We both really enjoyed it. I made half the recipe, and the portions seemed generous for a meal, at least for us. In smaller glasses, this would make a fun appetizer alongside cocktails also served in smaller glasses than these. To see what my Dorista friends did this week, check out their links here. To make it yourself, you can find the recipe in Dorie Greenspan’s book Around My French Table. Posted on 10 April 2015, in Fish, French Fridays with Dorie, Salads and tagged appetizers, avocado, French Fridays with Dorie, salmon. Bookmark the permalink. 12 Comments. What a wonderful post, Betsy. First I am happy, happy, happy that you can now experience legitimate thoughts that Spring is on its way. That Howard planted peas and that you have real evidence that your herbs survived a rough Winter is good news. Here we cannot plant anything until the snow is off Ruthie’s Run on Aspen Mountain. Michael and I were garderners so the minute that snow melted, he was out in our backyard garden turning the soil. It was such a great feeling for both of us. 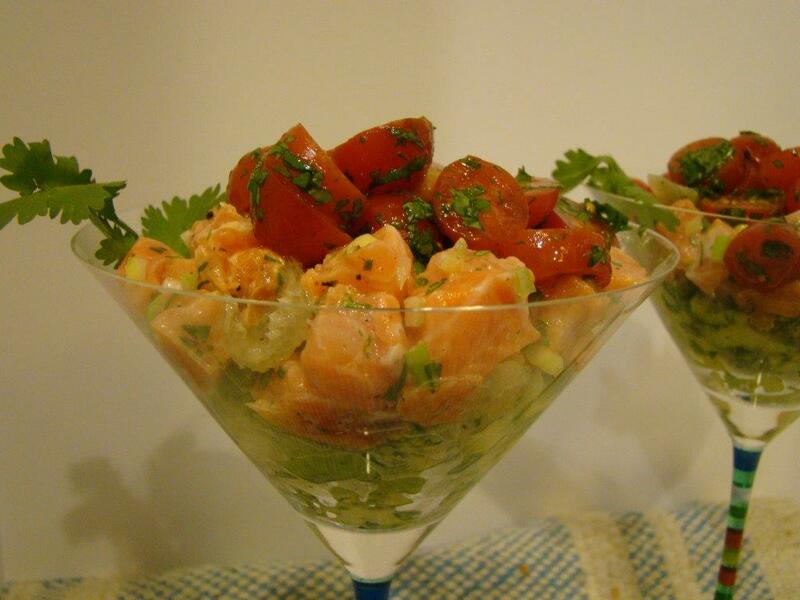 Your savory parfait presentation of the Salmon Tartare is beautiful as well as delcious-looking. Nice job. eat the raw fish. I made 1/4 of the recipe, and if Tricia’s hubby wasn’t available, out it goes. I will say I did taste a small bit of it, and believe it or not, it wasn’t the salmon that turned me off, it was the lime. Go figure. Happy Spring, almost. This isn’t the type of recipe I will be in a hurry to make again. Too polarizing! Just look at all the hoops Doristas went through to get it on their own tables! I don’t think I’d take the chance to serve it at a party. But if I did, I would serve it as you chose to in beautiful glasses. Who would be able to resist that? I like your presentation in martini glasses. I was pleased to use the pastry rings that I have had for years and never used for this. The salmon tartare was delicious! Betsy, your dish looks wonderful! I see your point, cilantro makes total sense, but since I had fresh mint and chives from the garden (yes, it’s well into spring here – but as you’re enjoying a lovely summer, we will be burning up – so it all evens out! ), I went with that combination, and really enjoyed it. I think most fresh herbs would be nice. What a presentation. Oh, so fun that Howard can get back to the garden! I have just ordered some things for our patio garden in Northern AZ. The “right” trees are budding, so I think that the chance of snow is behind us. Time to get going with all of that here too! And I may have even beaten back the attack of the pack rats! So maybe things will survive the night-time nosh! Betsy, Your Tartare looks fabulous! Those pretty glasses make a great presentation! I actually enjoyed this one…Bill not so much! So glad to finally have some warm weather. Bill has been outside for the last few days doing spring clean-up. I can’t wait to get out there to start planting! Hope you and Howard have a great weekend! Pretty presentation Betsy – and YAY spring! I’m sending warm thoughts your way. We actually spend this weekend doing a little balcony gardening. Nothing which we planted last year survived, but hope springs eternal and we are (perhaps a little overly) optimistic that our gardening skills will improve this year. What a fun presentation! I definitely took the lazy approach to this one. I didn’t even read the instructions carefully enough to realize there were 3 separate salads :-) I agree. I’m definitely starting to crave lighter foods now that the weather is *finally* warming up.